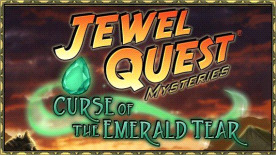 Jewel Quest Mysteries: Curse of the Emerald Tear combines heart-pounding thrills and adventure in this smash hit jewel-studded, hidden object game with match 3 mystery-solving gameplay! Travel to ancient Egypt and bring in to play your eye for hidden objects and your jewel-matching prowess to seek out treasures and jewels, hidden within stunning Egyptian locations. Swap jewels to turn tiles to gold in classic Jewel Quest boards, and decipher puzzles of logic and wit.